Commercial property markets have underpinned some of the best performing investment vehicles in Australia since the Global Financial Crisis. Despite a significant sell-down over the last quarter, Australian Real Estate Investment Trusts, or A-REITs, have been one of the leading sectors over the last five years due to their ability to provide strong risk adjusted returns through regular distributions of underlying rental income. With wider equity markets displaying volatility over the last year, and more currently since the US Presidential election, investments with exposure to commercial property have been relatively attractive. In comparison to the broader equities market and A-REITs, direct property has been the most consistent and stable performer, as is clearly shown in the above chart. The more defensive nature of the asset class is demonstrated by direct property recording a -14.2% correction during the GFC, while A-REIT investors were exposed to a more substantial loss of -70.4%. 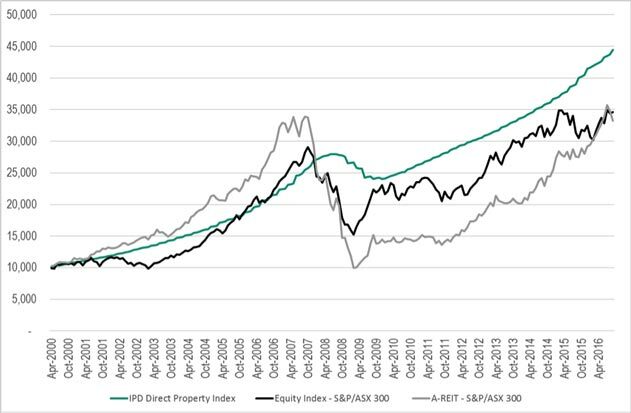 While the last month has seen A-REITs heavily sold, longer term results over 5 years for the various sectors saw direct property and A-REITs recording stronger returns than the broader Australian equities market. Perhaps most notable is the performance of direct property, which saw strong returns, despite recording the lowest loss during the GFC environment. So why has the property market, in particular direct property, performed so consistently? One of the most attractive characteristics about direct property is the tangible nature of the investment. While direct property is less liquid than equities and A-REITS, it is this illiquidity that provides stability and lowers volatility. Due to equities & A-REITs being listed on the stock market, this makes them more exposed to speculation and listed market volatility. The impact of the GFC on these two classes is clear with reference to the chart. In conjunction to this, improving market conditions, strong tenant demand and a stable economy have resulted in strong growth in property assets. Prime effective rental growth for example in the Sydney CBD and Melbourne CBD has recorded substantial uplift over the past 12 months (13.9% and 4.6% respectively according to Colliers Research) mainly off the back of elevated occupier demand and diminishing stock levels. Although A-REITs have outperformed in recent years, since the end of the FY16 reporting period the asset class has recorded a sudden downward shift in performance. Charter Hall’s Long WALE REIT float is a relevant case study. While it was successful on its second float after re-structuring the trust to take on more debt and offer a higher yield to investors, the first failed ASX float did cast some doubt as to whether long leased, passive assets are still considered the flavour of the month. The growing appeal of commodities stocks, rising bond yields and the less attractive original 5.3% distribution yield were contributing factors to the failed initial float. Also relevant here is the performance of the residential property market. While transaction volumes have cooled slightly on the back of restricted investment supply and tighter bank lending requirements, continued demand has led to strong growth in the capital cities with Corelogic data showing a 7.1% increase over the past 12 months to September 2016. While capital growth has been significant over this time, rental levels have not followed the same trajectory. This has caused net yields for residential property to tighten to an average of between 2-4% compared to Colliers Research latest indicators which place national prime office, retail and industrial property net yields ranging between 5.3% to 8.5%. It is an interesting stage in the cycle for Australian property markets. The market remains relatively liquid in property terms, with a large pool of both buyers and sellers looking to transact. A number of market indicators and commentators are saying that yields and total returns are beginning to plateau, suggesting we are at the top of the market, or close to it. As an example, JLL Research have compressed their Sydney CBD Prime Yield to 4.88%, which is the lowest since they have begun monitoring the market in 1970’s. What has not been clearly articulated, is the return of short to medium term fundamentals such as economic growth and effective rental growth, and the impact they will have on property returns and implied risk. On the demand side, the result of the US presidential election has brought some instability to financial markets including A-REITs, creating a flight to more defensive and tangible asset classes. We suggest that a strengthening occupier market across all sectors will sustain growth within the property industry as supply tapers and demand remains elevated. Looking forward, while interest rates will continue to have a strong impact over the medium to long term, the performance of property in any sector is largely determined by the asset specific factors, and market dynamics across individual asset categories. Therefore, as long as any interest rate hikes are a result of an improving economy, we expect both A-REITs and the wider property market performance to remain on a positive trajectory. Stay connected with regular articles and updates, as well as quarterly market news.